Thanks for buying Unstoppable Referrals! 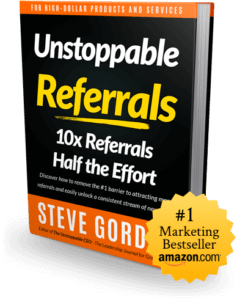 This page is filled with tools, templates, examples and even a free video to help you get the most out of your referral marketing. 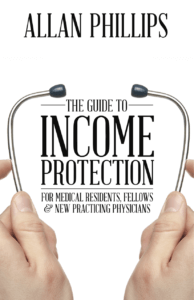 Read Chapter 1, then go through this quick assessment to learn how referrable you really are! Use this checklist to evaluate every new Promoter BEFORE you start a referral relationship with them! This is by far the simplest, most effective way to gather testimonials! Use this template as a starter to create your endorsed mailing letter. John’s kit includes his book, a DVD of an interview he did on a local TV station and a retirement “scorecard”–a self assessment referred prospects can use to discover how their current retirement plan stacks up. Not everyone wants to write a book (although you should get one written…you don’t necessarily need to write it yourself), a great alternative format for your referral kit is an interview, placed onto an audio CD. Here’s an example from my client McInnis Builders. These are the tools I recommend to members of my Private Client Group. Each one is designed to help you automate your referral marketing as much as possible, while still maintaining a human touch. Marketing automation and email marketing (recommended) – I’ve used most of the major marketing automation players and recommend both ConvertKit and Hubspot. ConvertKit has a ton of power (and is the tool we currently use). It’s got some of the easiest to use and most robust marketing automation features available. You can get a free trial of ConvertKit and take it for a spin. So why pay more for Hubspot (and it’s often much more)? In a word…integration. Hubspot will handle your email marketing/marketing automation, host your website, and act as your CRM (and a very good one). And everything just works together out of the box. You pay for that convenience. Hubspot also offers a free trial of some of its products here. Email marketing (on a budget) – We used to recommend MailChimp as the budget alternative. It’s a great system, but has some constraints. If all you ever want to do is send an email newsletter, and you’re not likely to implement automation it’s a good solution. However, if you think you’d like to eventually move into marketing automation, ConvertKit is affordable and robust. Customer Relationship Manager (CRM) – We currently use Nimble ..it’s simple to use, does lots of the work of entering contact data for you and has all the features most people need. Note: Some of the companies recommended above pay me a small commission if you choose to use their service. I’ve carefully selected services I use now or have used in the past. But, if you’d prefer not to use the affiliate links, Google them and sign up directly. As with all things in business (and life) the tools that are appropriate for our business may not be appropriate for you and your business. Do your own due diligence. Are you the "best kept secret in your market?" Copyright © 2018 Unstoppable CEO Press. All rights reserved.